Dutch restaurant owners have drawn fire from some diners after they replaced Israel with Palestine in a map of the Middle East at their Arabic eatery in Rotterdam. They say it’s for culinary, not political reasons. 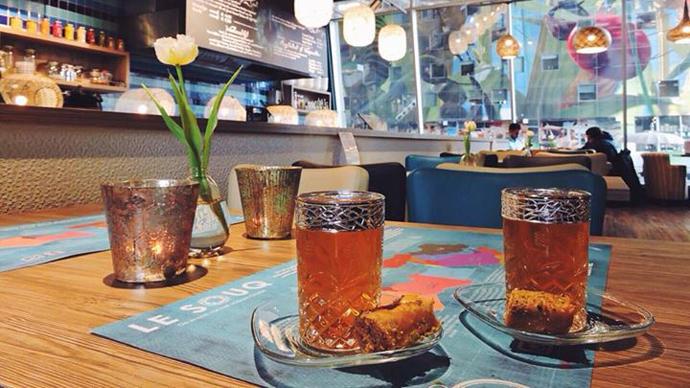 The owners of Le Souq, a restaurant at Rotterdam’s Market Hall whose main specialty is Middle Eastern cuisine, were ask to explain their actions by a local politician, who noticed the absence of Israel on the restaurant's placemat and its replacement with Palestine instead. Jan Hutten, regional chairman of the right-wing Christian Democratic Appeal party, said it left a bad taste in his mouth. “A new country in the Middle East? In Rotterdam’s Market Hall they are straightforward about Israel’s position. Bizarre,” Hutten wrote on Twitter, posting a photo of the placemat. She stated that the placemat only “names countries producing the dishes and products with which we work” and said the café did not expect the map would be taken from a political point of view. Maps of the Middle East with Israel left unmarked on them have caused controversy before. In 2013 the world’s biggest publisher of children’s titles left Israel off the maps in a children’s story book, replacing it with Lebanon, one mother had noticed. “I wanted to show my son where we lived in the Middle East, but I didn’t see Israel on the map; instead it said Jordan,” Adina Golombek, a Jerusalem resident who moved to Israel from Canada, told the Times of Israel. “Thea Stilton and the Blue Scarab Hunt,” published by Scholastic Inc, is an adventure story of the Thea Sisters, five teenage mice invited to Egypt to participate in an archeological excavation. Since the story takes place in the Middle East, a map is provided at the beginning of the book. It highlights modern Egypt and its neighboring countries – all except for Israel. While Sudan, Libya, and Saudi Arabia are clearly marked, Israel is fully covered by Jordan with the territories of both states evenly colored in red.